Our Spring Field Trip will deliver fun in an informative, engaging and entertaining way! 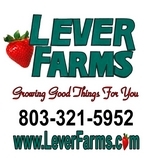 Lever Farms is a working family farm. We offer a hands-on, agriculture and science learning experience. In our strawberry and vegetable fields, students will gain an understanding of how their fruits and vegetables grow. Students will learn about plant stages, growing life cycles and so much more. Each participant will learn to harvest ripe fruit from the strawberry plant. All participants will be able to experience what it is like to pick-your-own fruit and take it home. Students will use all their senses to learn. The more students touch, smell and taste the aspects of what they are learning the more deeply they will understand and remember what they learn. Students will see a large variety of vegetables growing and will be able to recognize which plants produce the foods they eat. Target ages/grades include Pre-K through 2nd grade, but please just call us if you want us to accommodate an older group. Cost includes educational program, strawberry book, and a container of strawberries. After registering, the coordinating teacher will receive a packet for pre- and post- field trip information and activities for the classroom.